I find it worrisome that you can't tell the difference between them. Who do you (PeterS) feel wss the last truly qualified POTUS? And what successes does Trump have that the lady needs to compete? The lady has proven herself to be a grossly ignorant fish out of water. The Gentleman has proven a master of the American system. As Malcom Forbes said, "He who dies with the most toys, wins". Trump is one of the winners. Considering all the investigations trump and his family are the focus of the words luck or winner would never enter my mind. Right Peter........One washes glasses and sweeps the floor in a scuzzy bar and the other builds buildings, starts businesses etc. Sad that your not smart enough to figure that out. 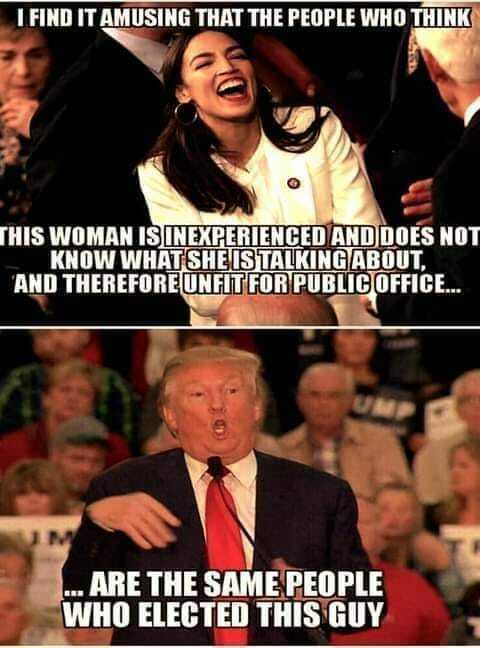 No wonder that tramp got elected. It's no wonder she's your new hero(ine). You're both depriving a village somewhere of it's idiot. The success that Clinton enjoyed was solely due to Newt and the conservative Contract With America. Newt forced Billy boy kicking and screaming to acclaim that even his zipper snake couldn't completely diminish. Make no mistake, however, contrary to the progressive spin machine, there was no $$$ surplus. Clinton chickened out killing Osama when urged to do so by the CIA and when Osama was in their scope. No 911 had he possessed a spine.